Pictured: Members of the Windhoek Fire Brigade in action at the house of higher education minister in Hochland Park. 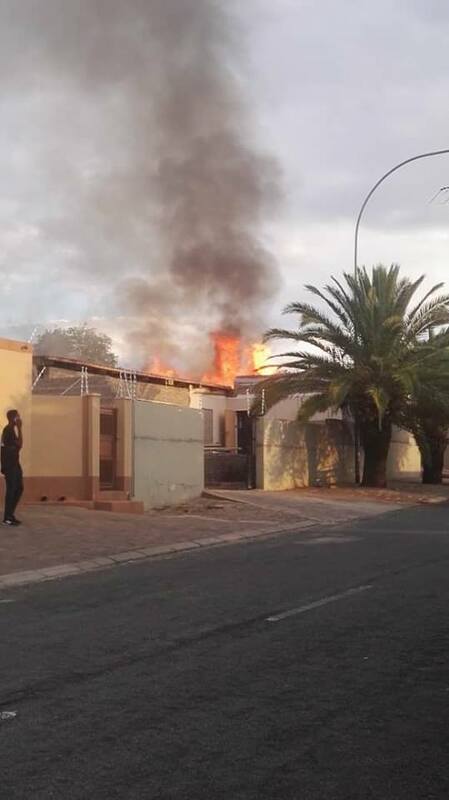 Fears that a light aircraft might have crashed in the Hochland Park neighbourhood of Windhoek had the Emergency Services scrambling to the scene in great haste. Upon their arrival on the scene it was quickly established that the smoke some people in the neighbourhood saw was coming from a house that caught fire by other means. 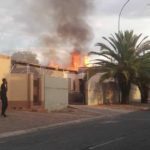 According to one of the first responders on the scene the house belongs to the Minister of Higher Education, Training and Innovation, Dr. Itah Kandjii-Murangi, who is currently is the north of Namibia. The flames spread fast and the fire got out of control quickly. Even though the Fire Brigade battled the blaze most of the roof and everything inside was destroyed. Fire fighters were on the scene for quite some time after the blaze was extinguished to prevent the fire from starting again and spreading to neighbouring houses.